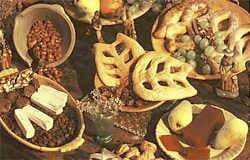 In Provence at Christmas the tradition is to have a celebratory meal called the " Gros Souper" on Christmas eve prior to attending midnight mass. The table is set with 3 table cloths and 3 candles and a meal of various traditional vegetable and fish dishes is served followed by cheeses. The high point of the evening however, comes at the end of the meal when the table is re-laid and out comes dessert. There are 13 of them, to reflect the number seated around the table at the last supper. According to tradition the first 4 desserts represent the four orders of friars. Raisins for Dominicans, dried figs for Franciscans, almonds for Carmelites and hazelnuts for Augustinians. Next comes walnuts and one or more types of dried fruit usually dates or prunes. Seasonal fruits provide another 3 of the 13 dessert items usually including apples and pears and either melon, grapes, mandarin or oranges. Nougat will always be part of the list and the final dessert will be the Pompe de Noel a l'huile d'olive, a light textured cake made from a yeast and egg dough, sweetened with sugar, flavoured with grated orange and lemon zest and sprinkled with orange flower water. The pompe is never sliced but always broken apart by hand and drunk with Vin Cuit ( cooked wine ) which actually refers to sweet local wines such as Rasteau or Beaumes-de-Venise.